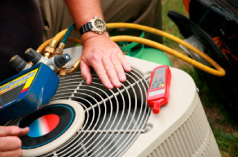 When your new air conditioning system or water heater arrives and is ready to be installed, our friendly NATE certified air conditioning installation technicians will carefully and professionally install it in your home or business. Our HVAC professionals are careful not to disturb sensitive areas. They’ll lay down carpet protection and wear shoe protection to keep your home, business, and yard clean. After the installation is complete, they’ll leave the area cleaner than when they arrived. Respecting your home or business is a promise we take very seriously. Every new system we sell includes a maintenance agreement to ensure it continues to operate as intended well into the future. That means you can trust Conejo Valley Heating and Air Conditioning to keep you comfortable for years to come! We’ll recommend the right solutions for your lifestyle, business needs, and desires, based on hundreds of available products. Our home and business comfort analysis will also take into account the physical requirements of your home. Since every home, business, and owner is different, it takes a custom comfort analysis to determine the best system for you. There are many standards, upgrades, and custom options available to choose from. The analysis will provide custom-made solutions that are best for you. Today’s innovative air cleaning products can exceed hospital air filtration standards. Zoning control is also available and allows you to heat and cool the exact rooms you want, to the exact temperature you want. Today’s high-efficiency equipment may nearly pay for itself in utility savings, so efficiency level is an important consideration. Consider the environmental benefits of energy savings from simply installing high-efficiency comfort equipment. Our FREE comfort analysis will help you understand and evaluate all these important considerations, helping you make your home or business more comfortable and efficient. Most people do not budget for a breakdown or replacement of their heating or air conditioning system. To offset the investment, we suggest using our convenient financing program as a simple, automatic, affordable way to pay for your new system or repair service. We offer great financing options, including seasonal rebates, specials and incentives. Your energy savings over time might also help offset the investment.